Our belief systems can be represented in our dress and are most evident in those who choose their clothing relative to religious obligation. A colleague inspired this post. She is fashionable within the requirements of Islam from her hijab down to her Tory Burch ballet flats. She wears the head covering we know as hijab but I don't think I have ever seen her wear the same scarf twice. And what a scarf it must be! The length required to wrap and pin and tuck is daunting to the non-hijab wearer. Hijab is in fact more than just the head covering. I understand it to mean "all that is required for the modesty necessary in religious obligation to Islam". It appears that "what is necessary" is not only dictated religiously but also open to cultural interpretation. Christianity also has its examples of religious obligation of dress. 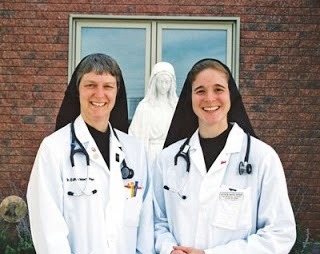 However those obligations may be restricted to formal religious orders such as Catholic nuns or to religious communities such as the Hutterites. 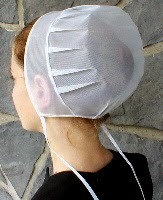 Whether a woman is wearing hijab or has her hair tied back under a net covering in the same way some Mennonite sects do, we immediately recognize their religious devotion. And that is exactly what the wearers want. It is obvious that religious obligation to dress facilitates recognition, and that can have both positive and negative reactions. The negative responses come from those who have been limited in their intercultural experiences and thus lack understanding. The positive responses, specifically from others who share the same religion, strengthen the sense of community and belonging. Those who wear hijab in work situations confirm empowerment owing to the respect shown for the work at hand with no perceived notions of flirtation and possible sexual harassment. What these women wear protects them from the negative on one hand but may also provoke the negative on the other. Recently Pope Francis was photographed wearing the headdress of a South American indigenous tribe . . . respect for others requires us to acknowledge and accept. Acknowledgement and acceptance, that is the essence of living together.